Near infrared red (IR) photography utilizes unseen (red) light just beyond the visible portion of the spectrum (400 to 700 nm) to generate imagery. Photography taken in the near-infrared part of the spectrum usually images light falling between 700 to 1000 nm. Photographs generated from the near-infrared part of the spectrum typically depict dark skies with white vegetation. When photographs are in false colour, skies can be a dark blue or cyan while vegetation is often yellow, orange or pink. Infrared portrait photography can yield equally unusual results, rendering subjects with blue-white skin, dark blue eyes, and blue-purple or deep red hair, regardless of the subject’s individual colouring. Kimberly (above) normally has hazel eyes, dark brown hair, and a semblance of skin pigment. Not anymore. Near infrared red photography requires a converted camera. Because digital cameras are sensitive to infrared light, manufacturers install a hot mirror filter in front of the sensor to produce better photographs taken in visible light. Modification for near infrared imaging requires this filter be removed so the camera can see infrared light. After the camera has been modified, a filter can be applied to the lens to specify what wavelength range you would like to photograph in. Once this filter is applied, only black is visible through the view finder. The image is either composed and focused prior to the shot or an electronic viewfinder/LCD screen is needed to see through the lens. Raw near infrared photography is magenta before it is processed into a black and white or false colour image. False colour means that the colour rendered is not “true colour” (ie. colour true to life). 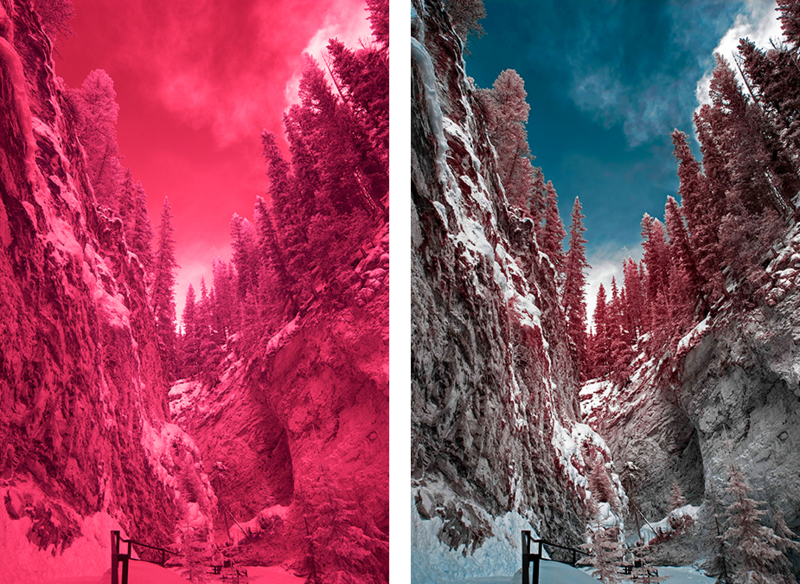 In near infrared photography, false colour uses colours generated from signal captured in the red, blue, and green channels of the original RAW image. In producing a false colour image from an infrared photograph, the image is white balanced. At this point, colour can simply be left alone (usually resulting in an orange/yellow sky and blue foliage) or the colour generated from the red, blue, green channels can be switched by mixing the red, blue, and green channels (resulting in a cyan/deep blue sky with pink/red foliage). False color results are unpredictable and can vary greatly depending on the strength of signal in red, blue and green channels. Typically, the stronger the signal, the better colour depth and intensity in the resulting false colour image. Black and white infrared imagery has more leeway but still requires adequate signal for sufficient image clarity and depth. Near infrared photography is dependent on a variety of factors but just one or two successful images from a shoot can make the entire effort worth it. It is a unique and challenging branch of photography that allows the photographer to experiment with images of the invisible world in unseen light.